Sometimes it's refreshing to find a song with a very candid title. Enter They Might Be Giant's "You're On Fire," which is not only a kickin' tune, but also literally about people being on fire. There you go. 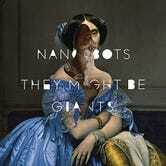 Off the band's brand new album Nanobots, "You're On Fire" is an unusually straighforwardly rocker, for a They Might Be Giants song, anyway. Actually, it shares a bit in common with another classic I've covered, "Til My Head Falls Off." While the instrumentation lends itself to off-beat and call-and-response guitar blasts that echo in stereo , the lyrics are predictably absurd. And before you ask, no I'm sorry, we don't have any articles about combustible heads.